Greyhound racing has been a sport—and a rightly contested one—in the United States since the early 20th century. Today, only six states have active dog racing tracks, and one of those states, Florida, has recently enacted a ban on the sport, with all active Greyhound racing tracks set to close by January, 2021. There is a lot of controversy around Greyhound racing, from how the dogs are bred and treated to the live lures that are sometimes used to bait them around the tracks. But perhaps the biggest source of debate is what happens with the dogs when their racing days are over. It’s a question that has gained heightened awareness with the news of Florida’s track closures. The state, which currently houses 11 of the country’s 17 active Greyhound racing tracks, will have thousands of homeless Greyhounds searching for homes when the ban goes into place. The history of what happens to retired or injured Greyhounds is a lurid one. Prior to the widespread involvement of humane groups, many Greyhounds were simply put down when they were no longer profitable on the race track. Others were sold to labs for experimentation. There are no verifiable statistics today on how many un-raceable Greyhounds get adopted versus those who face less humane fates. But tides have certainly turned in favor of rescue, and there are quite a few organizations that have dedicated themselves to helping as many Greyhounds as possible find their way from the track to a family home. If you’re interested in adding one of these smart and sweet dogs to your own family, read on for what you need to know about adopting a retired racing Greyhound. What Are Retired Greyhounds Like? There are certainly misconceptions about what retired Greyhounds are like. Many assume that they have uncontrollable amounts of energy or that they’re aggressive from years of competition. There is also an assumption that Greyhounds are no longer young and lively animals at the end of their racing days. But fortunately, all of this tends to be false. Greyhounds are incredibly adaptable dogs who adjust well to household living and make fantastic family pets. 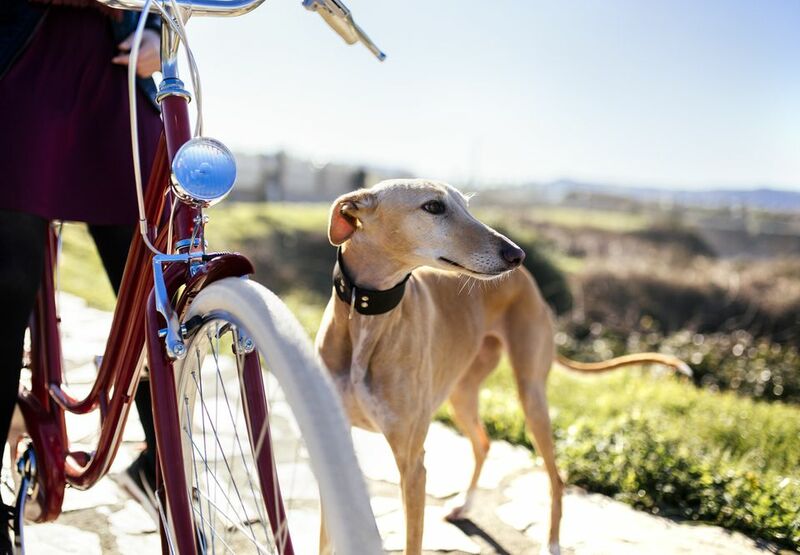 Greyhounds are bred for speed, (in fact, these lanky, long-legged dogs are the fastest breed of canid in the world, with the ability to reach speeds of up to 43 miles per hour), but that doesn’t mean that an adopted Greyhound is just going to zip around your house all day. They are notorious couch potatoes who enjoy a good nap with their humans as much as a run around the backyard. Overwhelmingly, Greyhounds are known for their social personalities, as well as their companionability, grace, and gentleness. They do well in apartments, and don’t require any more exercise than other dogs of the same size. Do note, however, that retired Greyhounds should not be allowed to roam off-leash in non-fenced areas, as their prey drive remains strong and they are hard to control once they have gone on the chase. For a list of Greyhound adoption organizations by state, visit the National Greyhound Association’s adoption page. The adoption process varies by organization. But unlike adopting retired TSA dogs or retired police dogs, there are many adoptable Greyhounds to go around, and you likely won’t have to face a years-long waiting list. To adopt a retired Greyhound, do some further research to find the organization through which you would like to pursue an adoption, and then follow the procedure outlined on their adoption page. Most of the time, you will be able to browse through available dogs just like you can for other breed rescue groups, and you will be responsible for meeting some key requirements (these vary by organization, but usually include access to a vet with experience treating Greyhounds). Rescue fees vary as well, but are generally comparable to what you would pay for other dog adoptions. Retired Greyhounds have so much to offer their humans, and demand very little in return aside from some love, cuddles, and a cozy coat to keep them warm in the winter months. And with so many currently needing homes and due to need homes in the near future, you have the opportunity to make a big impact not just for the dog who you adopt, but for the breed as a whole. To learn more about adoptable Greyhounds, visit the sites of the linked organizations above and discover all that you need to know about Greyhound history, care, and how to make one a loving member of your family.